What are the causes of liposarcoma? What are liposarcoma risk factors? What are liposarcoma symptoms and signs? How do health care professionals diagnose a liposarcoma? What are the various types of liposarcoma? What are the stages of liposarcoma? What is the prognosis of liposarcoma? What is the survival rate for people with liposarcoma? Is it possible to prevent a liposarcoma? Liposarcoma is a malignant tumor that arises from deep soft tissue fat. What triggers the development of liposarcoma is unknown. Liposarcoma risk factors may include radiation, family cancer syndromes, a damaged lymph system, and/or exposure to certain chemicals. Liposarcomas do not develop from common lipomas (benign tumors of fat cells). X-rays, MRI, and/or CTs may help suggest a diagnosis that needs to be confirmed by biopsy. The world health organization (WHO) recognizes five subtypes of liposarcoma. Liposarcoma stages describe the extent of tumor spread with stage IV representing the most extensive cancer with metastatic spread. Liposarcoma treatments may consist of surgery, radiation, or chemotherapy. Some patients receive combinations of these treatments. The prognosis of liposarcomas vary with the type in the location of the tumors. Round-cell and poorly differentiated cell types have a poor prognosis with a survival rate of about 50% over five years. It is not possible to prevent a liposarcoma. At best, you can lower your risk of developing a liposarcoma by avoiding risk factors. Liposarcoma is a malignant tumor that arises from mesenchymal cells (specifically, abnormal fat cells in deep soft tissue that multiply in an unregulated manner), mainly affecting middle-age people at sites such as the thigh, gluteal region, retroperitoneum, and leg and shoulder area. Occasionally, the liposarcoma can become very large. For example, the news media has described a 30-pound liposarcoma removed from the abdomen of a 63-year-old man. Liposarcomas are one type of soft tissue sarcomas. Liposarcoma cancer cells are similar to fat cells but are thought to develop from deeper fat tissues instead of superficial fat cells beneath the skin or mucous membranes. Although liposarcomas may develop almost anywhere in the body, most develop in the abdomen and limbs. Liposarcomas are rare. They represent less than 1% of all newly diagnosed cancers. Although it is not known what triggers the development of liposarcomas, they are usually noted after trauma when a "hard lump" develops and remains but trauma or injury is not a risk factor. Risk factors for liposarcomas may include radiation, certain family cancer syndromes (for example, neurofibromatosis, Gardner syndrome), a damaged lymph system, and/or exposure to certain chemicals (for example, vinyl chloride, dioxin). Liposarcomas do not develop from common lipomas, which are benign tumors of fat cells. decreased range of motion in the limbs. Many patients with liposarcoma will complain of a mass that they can feel. The mass can be soft and fleshy or even firm to palpation. Some doctors may initially try ultrasound, but the diagnosis usually requires standard X-rays that will help show whether or not any bony elements are involved. However, an MRI is usually obtained and may help suggest a diagnosis that must be confirmed by a biopsy. For many individuals, a chest CT is done because the chest is the most common site of metastasis (spread) of liposarcomas. The most common type is termed well-differentiated liposarcoma (about 50% of sarcomas). The next type is termed myxoid (resembling mucus). Round cell liposarcoma is an intermediate grade of fat-cell cancers that includes round-cell variants and is the most common type of liposarcoma in children and teens. A rare type is termed pleomorphic (meaning the cancer cells look different in size and shape) liposarcoma and makes up only about 5%-10% of liposarcomas. This type can be very aggressive. The last type is termed combined, mixed-type, or dedifferentiated liposarcoma, which is a high-grade sarcoma with an increased risk of metastasis. 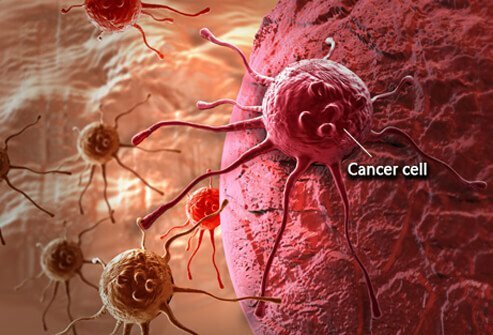 Once the tumor has been typed, it is usually staged to determine the extent of spread of the tumor at the time of diagnosis. The stages range from I to IV, with IV representing the most extensive cancer with metastatic spread. The treatment of liposarcoma is mainly surgical, with the goal to remove the tumor entirely and prevent its recurrence (achieving a cure) by removing all of the tumor cells. In the past, amputation was the surgical option for these tumors in the limbs. Currently, tumors that occur in limbs only require about 5% of patients to undergo amputation. Tumor removal by surgery in other areas of the body is the treatment of choice for liposarcomas. However, many patients are treated by a combination of surgery and radiation therapy. In fact, some patients are given radiation therapy before surgery to shrink the tumor. Chemotherapy in the treatment of liposarcoma is controversial, and experts in the field consider the question of chemotherapy for liposarcoma to be best addressed on a case-by-case basis. Some investigators consider chemotherapy of liposarcomas to be experimental. Because liposarcomas are relatively rare, your doctor should be a specialist with experience treating sarcomas. Chemotherapy has been done (for example, using anthracycline drugs) without great success. For unresectable (cannot be treated by surgery) or metastatic liposarcomas, trabectedin (Yondelis) and eribulin mesylate (Halaven) have been approved by the U.S. Food and Drug Administration (FDA) to treat the disease in patients who had received a prior anthracycline-based chemotherapy regimen, as both these drugs showed an improvement in progression-free survival as compared to other drugs. The prognosis of liposarcomas varies with the type and location of the tumors. Extremity tumors that are appropriately treated have a good prognosis as do the well-differentiated types and myxoid type tumors. However, round-cell and poorly differentiated cell types have a poor prognosis with a survival rate of about 50% over five years. As stated previously, if any mass or lump is noticed near or at a site of trauma, or if you develop any of the late symptoms of a liposarcoma described above, you should contact your doctor immediately. Many conditions other than malignant tumors can cause a mass or lump, and it is important to find out the cause so that appropriate treatment can be given. Most liposarcomas develop in people with no known risk factors. Consequently, there is no way to prevent liposarcomas other than to avoid exposure to their risk factors listed above. American Cancer Society. "What are the risk factors for soft tissue sarcomas?" Feb. 9, 2016. <https://www.cancer.org/cancer/soft-tissue-sarcoma/causes-risks-prevention/risk-factors.html>. Schwartz, Robert A. "Liposarcoma." Medscape.com. Mar. 23, 2018. <http://emedicine.medscape.com/article/1102007-overview>. Please share your experience with liposarcoma.